A thermos with some bubbling liquid nitrogen at the bottom. Liquid nitrogen is used pretty much everyday by someone in my lab. Liquid nitrogen is an extremely cold liquid coming in at close to -200°C (-330°F). Nitrogen’s natural phase is a gas. Its a fairly common gas to, making up 78% of the Earth’s air. When it nitrogen is condensed as a liquid it is essentially always at boiling temperature. I tried to capture the vapor coming off the bubbling liquid nitrogen in the picture above, but its difficult to convey what liquid nitrogen is like in a photo. Liquid nitrogen looks exactly like boiling water. If you put liquid nitrogen into a pot it would look just like a boiling pot of water ready for spaghetti to be added. But liquid nitrogen is not boiling water. It won’t scald your hand if you touch it. Liquid nitrogen is the coldest thing you will ever touch and can instantly freeze burn your hand. Even things that come out of liquid nitrogen are painful to touch with you hands. I can’t do it for more than a second. Using gloves to handle liquid nitrogen has another problem attached to it. When you wear gloves a natural layer of sweat and oil occurs between your hand and the inside of the glove. If your gloved hand is in the liquid nitrogen for too long, the sweat freezes. That’s just ice though. It’s happened to me plenty of times. I just yank my hand out of the nitrogen and my bodyheat melts the ice back into sweat right away. So if its so dangerous, why do we use it in the lab? Liquid nitrogen is useful because it stops all biological activity. That’s why its dangerous and why its useful at the same time. 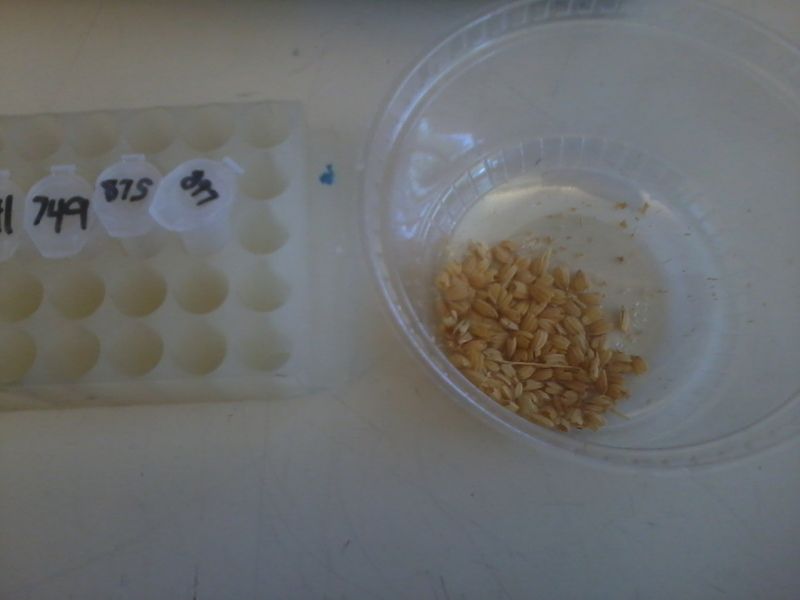 When working with a dead specimen its best to prevent bacterial decay. Bacteria can’t survive at liquid nitrogen temperatures, so its used for that. 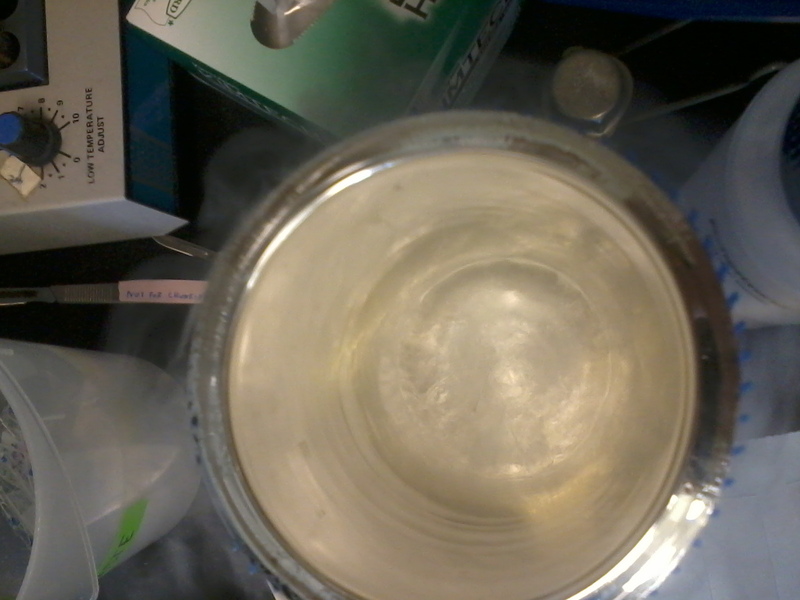 Liquid nitrogen is also used to isolate RNA from a specimen. Every cell has RNA inside of it, but RNA is also what many viruses are made out of. Cells quickly learn to distinguish RNA inside the cell as good and RNA outside of the cell as bad virus RNA. Cells have defense mechanisms to destroy RNA called RNases. RNases can’t work at liquid nitrogen temperatures though! I was using liquid nitrogen for a third purpose today, just to quickly freeze some worms. More on why I need to freeze worms another day! An stream interface I made for streaming Faster Than Light. Still in progress! A few of my friends suggested trying to stream other games besides Hearthstone. I am interested in doing that at some point, so I’ve been working on stream interfaces for the other games I play. Right now I play League of Legends, Hearthstone, Faster Than Light (FTL), Skyrim, and Diablo 3. The stream client I use, XSplit, only lets me have four different stream interfaces set up at a time. More interfaces are possible if I buy a subscription for their software instead of using it for free like I am now. I haven’t played much Diablo 3 at all lately so that’s the one of the five I’ll be leaving out. A few weeks ago I began to see it more as hamster wheel than a fun way to spend my time and have quit playing since. There are other hurdles for creating interfaces for other games as well though. I’ve always found a stream to be way more entertaining if I can see the streamer’s face, but where does the face go? 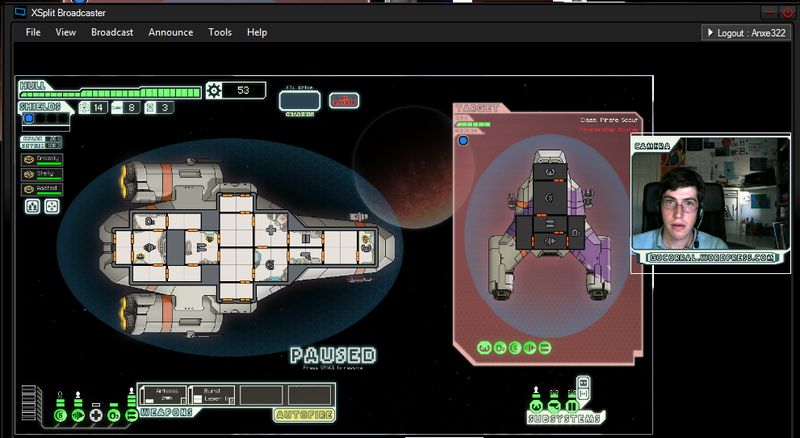 I struggled a lot with that issue while making the FTL interface pictured above. Initially I had the game filling the entire stream. I tried putting my face in the top right, but that blocked enemy ships. I tried putting my face in the bottom right, but that also blocked enemy ships. Bottom left blocks my ship’s power use. Top left blocks my ship’s health and crew. Middle left worked okay, but I ran into a size issue there. My face was either too small to matter, or it was blocking the back part of my ship. I ended up scrapping the idea of having the game fill the entire frame of the stream video. I wouldn’t call the picture above a final product, but it was the best way to include the game as well as my face. There’s other stuff to add as well. In my Hearthstone interface I added the URL address of my blog at WordPress to try and get crosstraffic. I’d like to do that for FTL as well. I’d like a logo of some kind for FTL too, like the Hearthsteed pack logo I made for Hearthstone. Eventually I want to add in a donation, subscriber, and follower trackers, but I’d like to establish myself more before going on to that part of the interface design. I’m committed to keeping the interface art grounded in the game I’m streaming though. Using edited screen captures from the game has worked for me on that, so I’ll keep doing that in the future whenever possible. 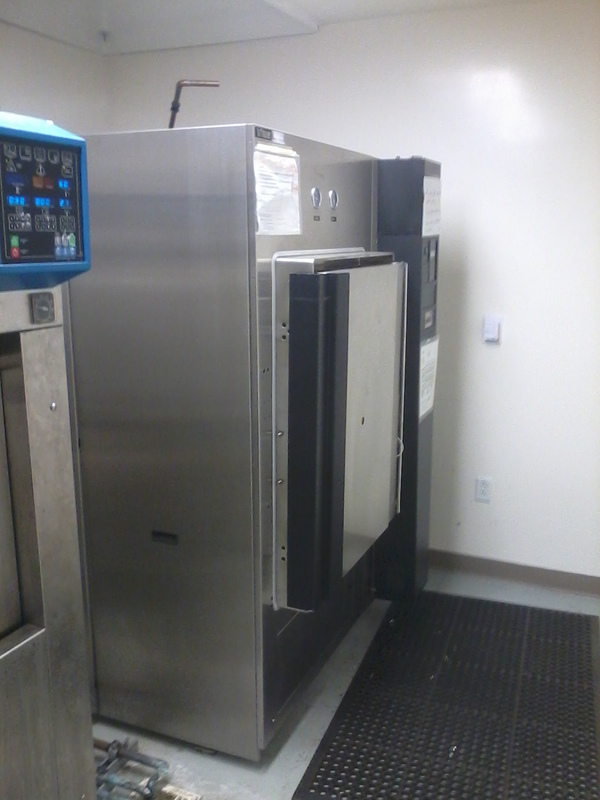 The big autoclave at my work that can hold four trays worth of autoclave materials. I’ve mentioned autoclaves in my science posts in the past. Autoclaves are one of the basic sterilization tools in a lab. The autoclave pictured above is one of the bigger ones around used by the people in my rice lab. What is an autoclave? Basically a its a steam oven. When scientists were first trying to sterilize stuff, boiling a solution on a stove was the easiest way. But boiling has a problem. Say you want to create a solution of 3 liters of water with 4 grams of salt per liter. You measure out 3 liters of water and you pour in 12 grams of salt. But now you need to sterilize it. You put it on the stove to boil. After it boils you measure the volume of your solution and now only 2.5 liters are left! So the solution is sterile, but its no longer the concentration you wanted. There are ways to work around this obviously by adding more water or less salt, but that gets tiresome. Eventually a French scientist, Charles Chamberland, invented the autoclave to avoid this sort of problem. The temperature inside an autoclave heats up to 121°C (250°F). This is a higher temperature than boiling. Normally water would boil in an autoclave and you’d have the same problem, but heating isn’t the only thing an autoclave does. The air pressure inside is about 20 times room pressure. This air pressure forces the liquids you place in an autoclave to stay liquid instead of evaporating into gas. Thus the temperature can be raised to kill any bacteria, microbes, or other nasty things in your solution of salt water, but the solution does not changed its concentration. The most interesting part for me is why the machine is called an autoclave. Autoclave is a Greco-Latin word that means self-locking. With a normal oven you can open it at 250°F (121°C) and you’ll be fine. But what if that oven was full of 20 times the amount of steam that normally would be in there? The steam would fly out of the oven and give you horrible burns if the autoclave was opened suddenly. Thus it was very important for Chamberland to prevent that accident. The autoclave cannot be opened until the steam has been condensed into water and removed from the machine. The bottom left of the picture on this blog shows the pipe where the hot water comes out of the autoclave. The different items you can have in Hearthstone: cards, packs, gold, and dust. I wanted to talk a little bit about the different types of currency in Hearthstone. All the forms of currency are essentially funneled into getting more cards. The first currency the game introduces is gold. Gold is essentially interchangeable with real world money. Both can be used to purchase card packs or arena tickets. Arena is a game mode similar to gambling. You create a deck and then try to win as many games as you can before you accumulate 3 losses with that deck. After finishing an arena run, the game awards you a pack and a few other things as seen in the picture above. Gold and real world currencies can only be used to buy packs for 100 gold ($1.50) each or arena tickets for 150 gold ($1.99) each. Each pack contains 5 cards. Cards come in 4 degrees of rarity, common, rare, epic, and legendary. The average pack has 4 commons and 1 rare. The card won from the arena run pictured above is a common card. Unlike other CCGs there is no way to trade your cards with other players in Hearthstone. 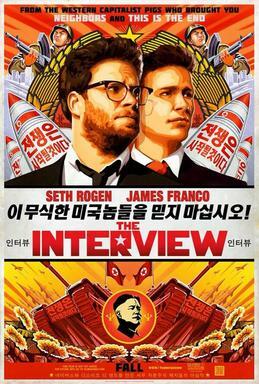 Instead, cards must be traded with the computer at a bad exchange rate. Card exchange is mediated through the dust currency I mentioned earlier. The exchange rate is pretty bad as shown in this table. It takes 8 dusted common cards to get 1 common card that you want. 5 rares to make 1 rare. 4 epics or legendaries to make another epic or legendary. A pack is worth 100 gold and that sets up the exchange rate for other things in the game. 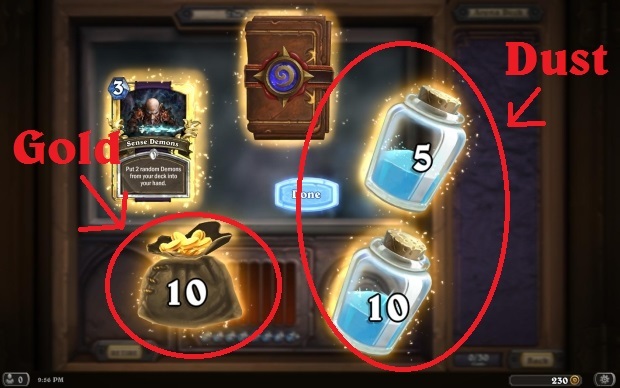 The value of an arena run is always compared to what you would get if the 150 gold cost for the arena run had been spent on a pack instead.At one point I wondered what the exchange rate between dust and gold should be. So an average 100 gold pack gets you 4 commons and 1 rare. The above table shows that the average pack is worth 40 dust. I’d say that number is slightly higher as occasionally more rares show up and epics and legendaries can pop up as well. I’d estimate the value of a pack to be at 50 dust. So the exchange rate is 1 dust = 2 gold. So if you’re new to playing and are disappointed when an arena run give dust instead of gold like I was, don’t be that way. Dust is a good thing! At least in Hearthstone. An image taken from one of the streamer’s I like, AppleJacked. I did my first stream on Friday and it went pretty well. I’d expected to get 4 or 5 viewers, but I got 9 at the peek of interest in the stream. I’m not sure how well I did on other aspects of it though besides popularity. Was I talking too much or not enough? Should I have been playing music? Should I have had more interaction with the people watching the stream? I feel like interaction is the way to go. Part of the reason I didn’t do much interaction was because I had the game in full screen mod so I had to alt-tab out just to look at the stream comments. Next time I think I’ll keep the Hearthstone game in a small windowed mode and have the stream chat open in a browser window to look at. Then I can see what people are posting as it happens and reply as soon as I can. I was frustrated by the stream delay, but that happens to every streamer I think. The stream is about 10 or 20 seconds behind what I’m actually doing because it has to go out to the Twitch server and then from there to your computers. This means that when I respond to comments it will be 10 or 20 seconds behind if I respond by talking. I could respond by typing in the chat, but I haven’t seen any streamers do that. I can only assume that no one does that because it isn’t popular with the people watching. They want to see you talk to them, not type to them. It’s also important for me to enjoy streaming. Right now I’m just doing it for myself. If it’s not fun, I should stop. I won’t lie, it was more stressful than just playing Hearthstone on my own. I tried to keep talking constantly about what I was doing and that was tiresome. The next day I felt like I didn’t want to do anymore streaming at all. But now that I’m a bit removed from the tiring aspect of it, I think I liked doing it a lot. So I’d expect more Hearthstone streams in the future. Maybe League of Legends, Faster Than Light, and Skyrim as well once I figure out a good stream look for those games. 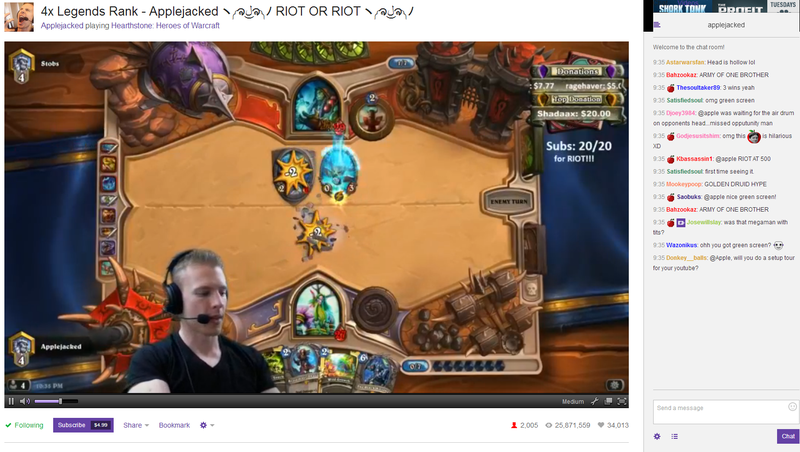 Oh, and AppleJacked is a cool streamer in the picture above. If you like interaction between the streamer and the audience then he’s your guy. He plays songs, shows off his muscles, and says his to new people. Really cool guy.